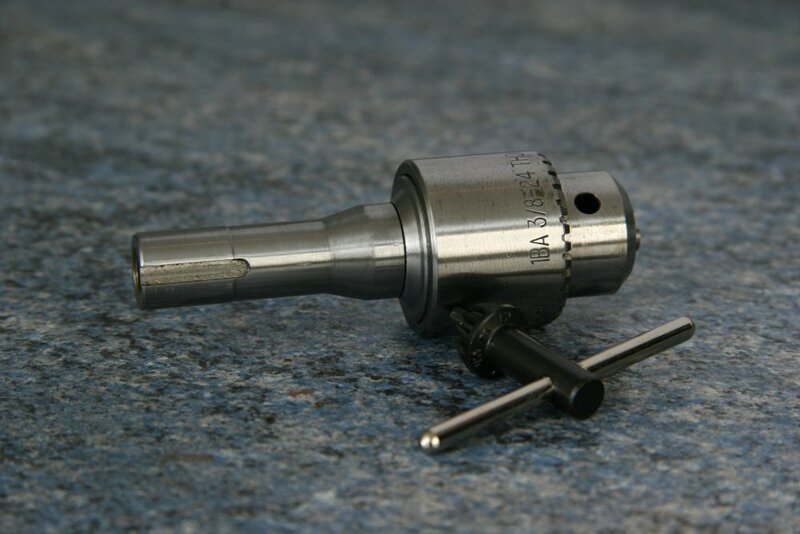 RGB14 Drill Chuck A high precision 0 - 4mm (5/32") drill chuck supplied with mounting arbor. RGB15 Drill Chuck A 0 - 6.3mm (1/4") drill chuck supplied with mounting arbor. 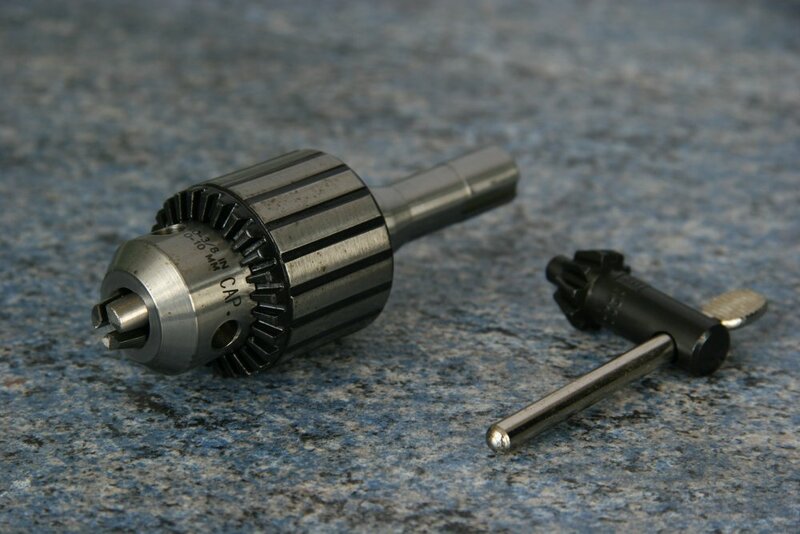 RGB16 Drill Chuck A 0 - 9.5mm (3/8") drill chuck supplied with mounting arbor. B23 Imperial Collet Set Imperial Collets for the (B100) Vertical Milling Machine are sized: 1/8", 3/16", 1/4", 3/8". B24 Metric Collet Set Metric Collets for the (B100) Vertical Milling Machines are sized: 3mm, 4mm, 5mm, 6mm, 7mm, 8mm, 9mm, l0mm. 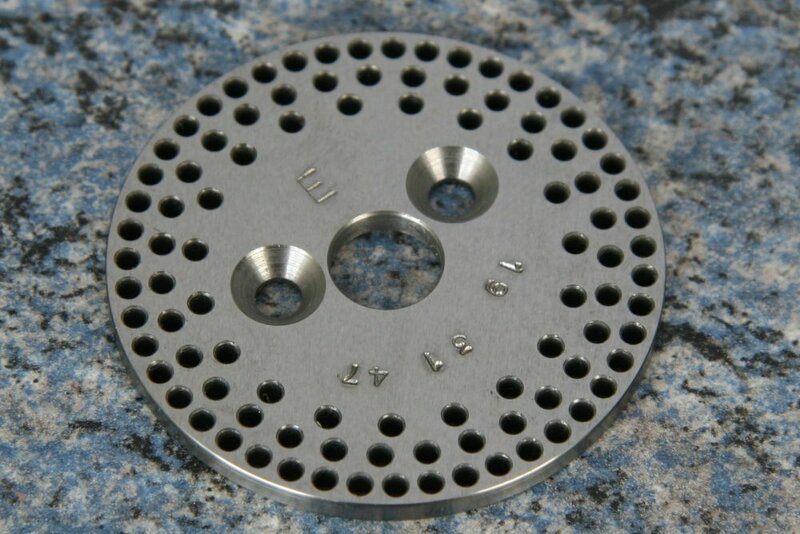 B25 Individual Collets Any imperial or metric size of Collet may be purchased. 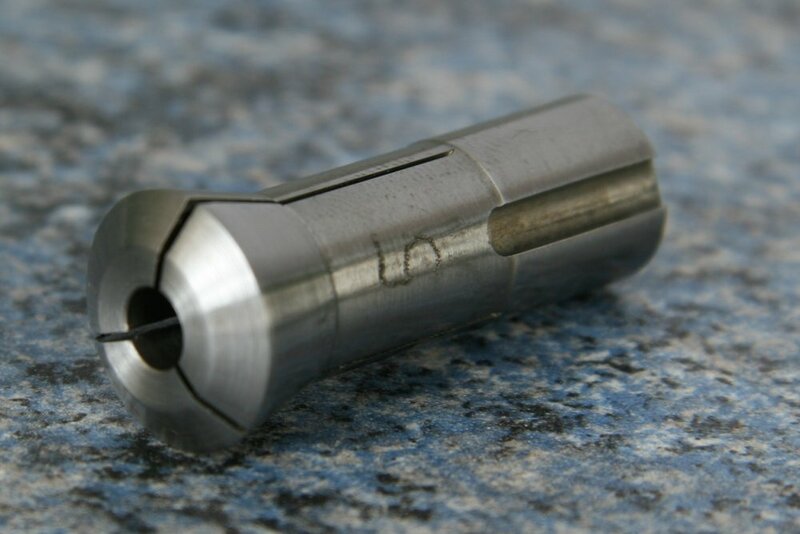 B26 Blank Collet A Blank Collet is available and can be bored and slit to a special size requirement by the Vertical Milling Machine owner or by Cowells, (please contact us for details). RGB56 Angle Plate The angle plate is of cast iron and is here depicted bolted to the lathe's faceplate (RG28) thus ensuring that the surface about to be machined ("faced") will be square to the surface mounted on the angle plate. RGB57 Machine Vice The vice body is of cast iron, machined to close tolerances and has four fixing holes. The screw has a hexagonal head to aid clamping. The steel jaw may be locked into position via a cap head screw and square nut running in its own channel in the vice body. Tee-nut fixings are supplied. (includes one division plate RGB62) The solid steel body of the dividing head is ground on all faces and is drilled to accept studs up to 6mm diameter. It is capable of being mounted on two of its faces. 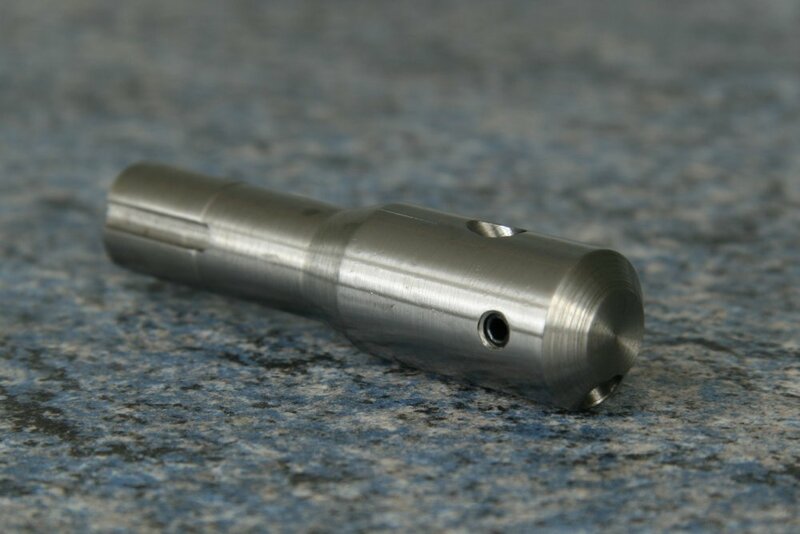 The spindle has the same 14mm x 1mm thread as the lathe chucks and is hollow with a no.0 Morse taper. 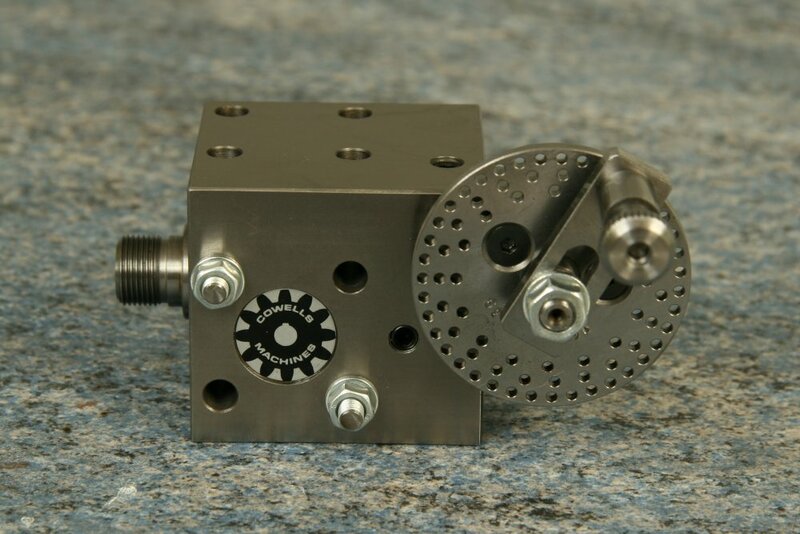 The spindle is driven by a 40:1 ratio worm and wheel; adjustable to eliminate any backlash. 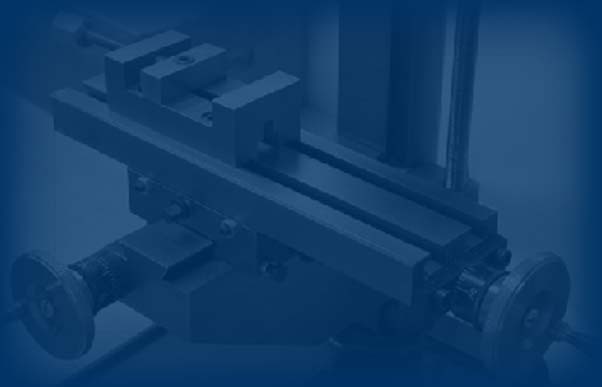 A spindle clamp is also provided. 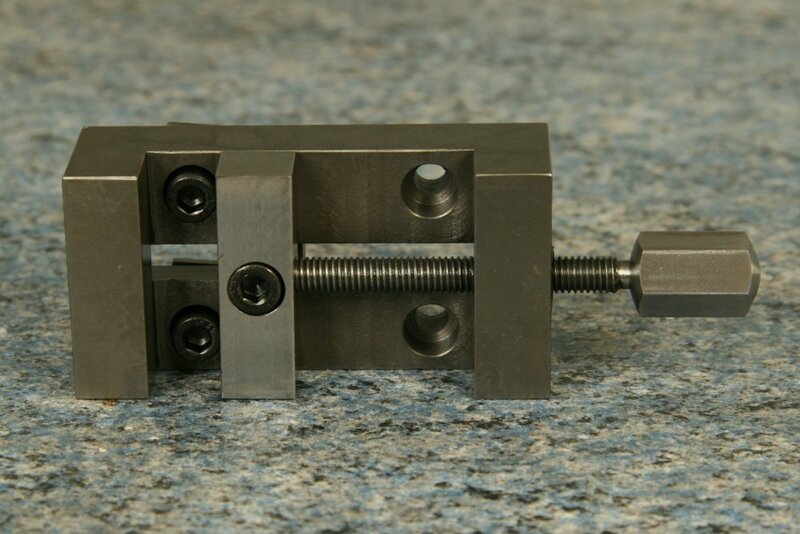 A steel raising block is also supplied should clearance for the mounting of a 3 Jaw Chuck (RG9) on the Vertical Milling Machine (B100) be required, for example. The unit is supplied with fixing studs and the appropriate tee-nuts. RGB62 Division Plate These are of steel and are ground. Seven plates are available (including a blank). RGB63 Blank Division Plate This may be machined by Cowells or the customer to special requirements. The above plates cover all numbers up to 40 and the following up to 120:- 41, 42, 43, 44, 45, 46, 47, 48, 49, 50, 52, 54, 55, 56, 57, 58, 60, 62, 64, 65, 66, 68, 70, 72, 74, 75, 76, 78, 80, 82, 84, 85, 86, 88, 90, 92, 94, 95, 98, 100, 104, 105, 108, 110, 115, 116, and 120, and on to a maximum of 392 divisions. (includes one index wheel RGB65) This index unit is a simplified form of the dividing head (RGB61). The unit features a solid steel body ground on all faces drilled to accept studs up to 6mm. The spindle has the same 14mm x 1mm thread as the lathe chucks, and may be locked via a brass pad and grub screw into position. The unit may be mounted on three of it faces. Six division wheels are available the unit is supplied with one wheel of the customers choice. 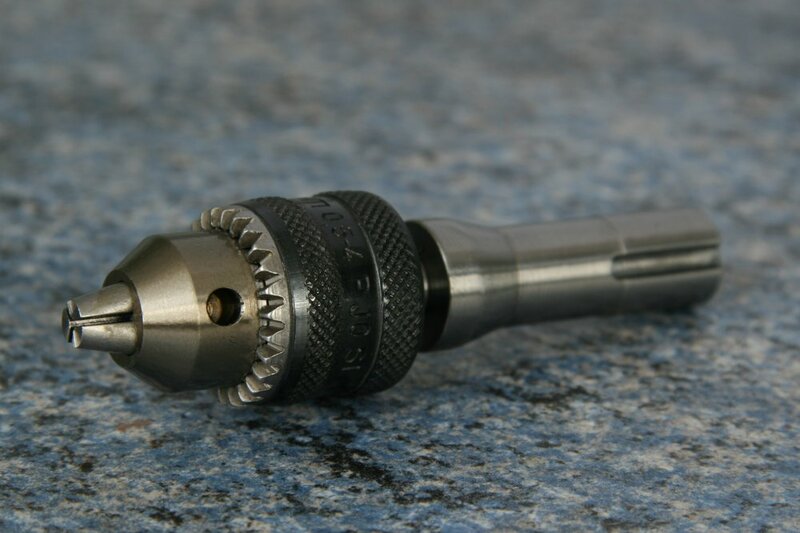 The accessory permits one to accurately rotate a component fixed to its spindle through a definite arc by means of a plunger locating in a splined wheel. RGB65 Index Wheels for RGB64 Six steel wheels are available. B67 Clamping Kit A set of tee-nuts, studs and clamps for securing work to the Vertical Milling Machine table. B68 15mm - 30mm Flycutter Bored to accept 3/16" dia. tooling. Two locking grub screws are provided. B69 30mm - 60mm Flycutter The 30mm - 60mm flycutter is bored to accept 5/16" dia. tooling. Two locking grub screws are provided. RGB82 Drive Belt V.Mill drive belt for (B100) Vertical Milling Machine.